The store of preserves in the old house was a common part of rural life. 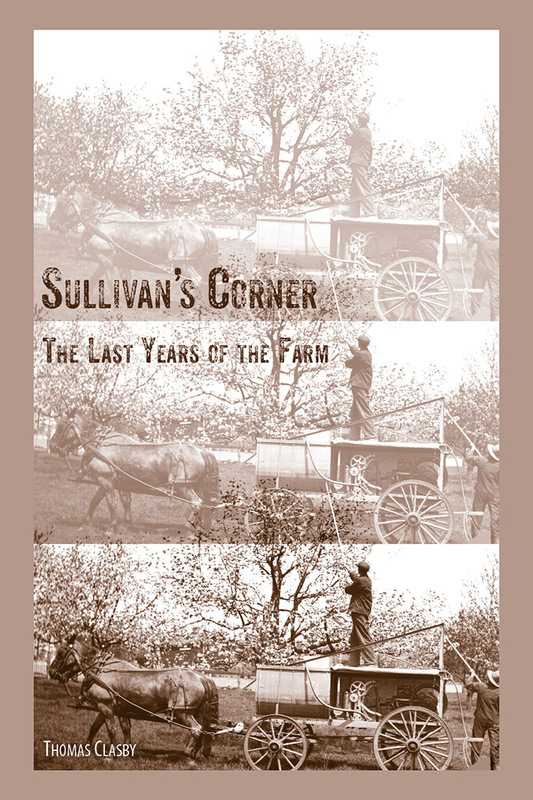 Like most farm families, the Sullivans had long depended on their own produce, put up in mason jars, to get through the months between growing seasons. In these later years, they did less of it — canned goods from stores being so convenient and economical. But Nellie was still inclined to put up a few things: foods she was fond of, like her own piccalilli relish, or things she just had a surplus of, green beans and cucumbers. My mother pitched in to help with those efforts, but developed little enthusiasm for the job herself. With encouragement from Nellie, however, and the need of packing a school lunch for me, she did undertake making her own grape jelly for a few years. The grapes grew on a trellis my father built, shortly after the house was finished. The trellis stood between the house and his shop, and became a grape arbor with cuttings Frank transplanted from Concord vines that had been growing elsewhere on the farm. The vines spread quickly and produced in abundance — yielding, easily, two or three pecks of fruit by then. Concords are not a table grape — too tart and seedy. Cooked and sweetened, though, the jelly made from them was popular then, as now. Harvesting was the easy part. Making the jelly took a lot of work. Basket-loads of grapes had to be mashed by hand, and the juice strained through cheesecloth. After that came boiling it down and dissolving in a frightful amount of cane sugar. Next there was the steaming and filling of jars. And finally, when the jelly began setting, came a quarter-inch of melted paraffin poured on top to seal it. I did a lot of the picking, but then, I was the sole beneficiary of the rest of this effort — in the form of grape jelly sandwiches that I took to school. The beginning of first grade had come as something of a disturbance to my sense of order. Even with regular pronouncements from Nellie and my mother describing the rewards of school, as it approached, the actual experience brought the discovery that going there meant I would not be around the farm — deciding for myself what needed doing. The very notion that daily activities of the farm could go on without my oversight was an unwelcome lesson. In time, I did reconcile with formal education. The grape jelly may have helped. That started during second grade, at the Burley School — Nellie’s old domain. But the greater balm came from summer vacations. Among the keenest images I have from any summer is a memory of the old house with the second-floor windows wide open, bedrooms airing out in anticipation of houseguests. The sound of rugs being beaten on a clothesline flowed in along with the scent from blossoms on old rose vines. Ever since Mary had passed away, her old room was used anytime someone stayed over. In the summer of 1952, that room, and Kate’s too, were being readied for a visit by Teresa and Kathy O’Brien — daughters of Tommy O’Brien. Teresa, then fifteen, and Katherine, twelve, were coming to spend some of their school vacation in a place where they had often played when they were little and lived just two miles away. Ahead of their arrival, a sense of happy anticipation filled the house along with the summer air. Nellie loved having young people around — and thought that any time they spent on the farm was good for them as well. Over the years, many had gotten the chance. In their youth, my father’s sisters, Polly and Ruth especially, came numerous times, traveling up from Boston by train. And just four years back, my cousins — Polly’s ten-year-old twin girls — had stayed too. These days, with Kate gone, the big house was just too empty for Nellie. And she had missed Tommy and his children badly since their departure to Portland. Tommy had come to the farm a little after my father, and the two of them shared the attic in the old house through the 1920s and into the 1930s. Both had arrived under similar circumstances. Tommy’s early life, though more severe in some ways, was much like John Clasby’s. Two years younger, he was born in East Boston, near the working waterfront there. As happened to my father, Tommy had lost both parents as a child — his mother while he was an infant, and his father when he was just five. Later, he too had been hospitalized with medical problems, and came to the farm in his teens hoping to restore his health. Some other boys came during those years, for short durations. But Tommy, like my father, formed close ties with the Sullivans, and stayed on until he married and moved out to a place near the Willowdale Dam. His marriage broke up after a while, and for reasons I never learned, Tommy eventually left Ipswich. Maybe just a business opportunity that came along. No matter the cause of his leaving, he never really got beyond the reach of Nellie’s affection. The visit that summer was to be a reunion. While she’d driven to Portland a few times since their leaving, Nellie had not seen enough of Teresa and Kathy over the years since they were nine and six. She and Frank were godparents to Teresa, and Nellie was looking forward to time with two girls she thought of as granddaughters. She wanted to hear all about their recent lives, and retell her stories about their father when he was young. The farm was a carefree place to be a child. And that seemed to be an uncommonly lighthearted summer — with Kathy and Teresa there, and the Andreozzi brothers over daily from across the street. The long days were full of play — endless games of hide-and-seek among the outbuildings. The close-in ones formed something like a small village. There was no end of places to conceal oneself. Opposite the back door of the old house, near the spruce grove, was a three-bay garage. Nellie’s navy-blue Plymouth was kept in the first stall, the middle one was vacant then, and the last held a wagon with a cordwood saw. Across the driveway from the garage, next to my father’s shop, was Frank’s guinea hen house — a third relocated building, this one a small farm cottage, moved there from the Turner Hill estate when that property was closed up during the war. That must have been an opportunity that came along on a perfect day — too good to pass up. And the little house did have a second life, even if it was short. The optimism it represented was founded on a minor food craze of the 1930s, when the pheasant-size guinea fowl grew in popularity. It looked, for a while, like an attractive market to go after, but the guinea hen never caught on with the public as “the Sunday Bird.” As that business tailed off, Frank’s efforts returned to his more reliable Bronze Turkeys. So, although it had seen use for several years, the structure sat vacant, on temporary cribbing, waiting for a foundation that never was put under it. Between there and the barn was a small milk house where canisters of raw milk were kept before being picked up by the dairy truck. And, biggest of all, of course, the barn itself. One way or another, we kids made use of them all. Other times there were excursions farther afield — wandering down through the meadows and woods to the river. Or lingering at the gravel pit to take turns sitting in the rusted shell of the Ford roadster that Nellie had bought for Jack, pretending to drive while staying wary of the paper wasps that had made it their home. Some days there were chores: shelling peas for dinner, or a little token weeding in the vegetable garden. That was light duty. What was planted then was pretty much limited to amounts for our own use. On a rainy day there were Jack’s old board games, in the house, accompanied by some homemade root beer that Nellie put together. And, of course, the daily routines of the farm went on as always — cows led out to pasture in the morning, and brought back in for the afternoon milking. Certain memories, I suppose, may actually be a kind of collage — a composite of fragments which long ago merged into the scene that’s remembered. In one image from that summer, which I can’t be certain formed from a single event, some of us children were in the barn watching Frank at work, milking. They were secured in wooden stanchions that faced a long feed trough. The edges of the side rails against their necks were worn round and rubbed to a high polish. We were all on the back-side — Frank was seated on a low stool between two cows, somewhere in the middle of the row, us standing nearby. The milk hitting the pail between his feet made a sound something like, “tiss–tiss, tiss–tiss,” rhythmic pairs, repeating, trancelike. Milking was the daily constant of Frank’s life, and almost always a solitary job, just him with the animals. So I like to think that, as he went about his work, in this age-old fashion, Frank was glad to have this small audience. For, that summer on the farm, this work must have been done with a sharpening awareness that all of this would soon be part of the past. By then, the milk herd, once around a dozen cows, was down to six or seven Guernseys, milked by hand, twice a day. Every day, the raw milk was collected into five- and ten-gallon canisters to be picked up by the creamery truck. In a year, those cows, altogether, might have given four thousand gallons. For the better part of an hour spent each time on the milking alone, some days Frank probably got just one ten-gallon can of raw milk for the truck. On a better day, perhaps another five. Barely enough, either day, to justify the stop. With milk selling at the store for twenty-one cents a quart, maybe five or six cents, I would guess, went to the farmer. Less than twenty dollars a week. And the work was simply getting to be too much — the labor of managing even this small herd, let alone the other jobs, like haying. As a younger man, Frank was limber and hardy. But in these late years, the decades of toil had used up much of him. He managed the soreness of the hernias with a truss-belt. A surgical repair was out of the question. Even though, for his part, Frank was unbothered about taking a knife to the belly of a cow prostrate with stomach bloat, he was unwilling to submit to any such remedy for himself. And, anyway, he very likely felt he couldn’t spare the time for it. The end of summer in 1952 — as every year then — was marked by two events: the Topsfield Fair and the start of a new school year. The county agricultural fair opened on Sunday of Labor Day week and ran through the following Saturday. We went on Tuesday — Frank and Nellie and my mother and I — after the holiday crowds, but while the exhibits were still fresh. The harvesting by local farms wasn’t all done, but for those engaged with farming in some way — growers and dairymen, buyers and brokers, seed and equipment vendors — it was time for a needed break from the work. Time, hopefully, to celebrate a bountiful year, or in any event, compare notes about the past season with peers from surrounding towns. We got in free with exhibitor passes issued to Frank for his years of service on the poultry committee. He and Nellie were dressed in the clothes they wore to church. We made the rounds of various exhibition halls to inspect the displays, and probably paused to watch a demonstration of some sensational new product. There were no entries from our farm this year. For Frank and Nellie, attendance was now for seeing what everyone else was showing. In, around, and out of barns dedicated to cattle, and sheep, and fowl of every sort, and on to other buildings for vegetables, and fruit, and flowers, and the homemaking arts — progress stalled, here and there, whenever an old acquaintance was met. Then, at some appointed time, there was a pulling contest to be seen — teams of oxen or draft horses dragging a sled loaded with several tons of weight to see whose could pull the heaviest load the farthest. A staple of country fairs, even now. In past years, the racetrack would have kept Frank there into the evening to see the harness races. But, as of a couple years back, the trotters and sulky carts had been replaced with greyhounds to draw bigger crowds. Frank would not be among them. He had no interest in that. Fairs are a timeless attraction. We’re drawn for many reasons — midway amusements and food concessions not the least. And the Topsfield Fair today, in many ways, looks almost as it did then. The dog racing lasted a couple of decades, I think. But even before that was over, this fair — as an agricultural event — was in its twilight of mattering to a populace whose livelihood revolved around farming. By late in the afternoon, all in the party worn out, but sated, we returned to the old Plymouth for the trip home. Nellie navigated over back roads that she preferred to facing the Turnpike traffic coming for the races. The next day, for me, would be the start of third grade — with Miss Brown taking over the class that Miss Friend had promoted last June. That fall, the dairy herd was sold. Strikes me as odd, but unlike so many lesser moments, I have no recollection of this at al. Probably the cows were taken away while I was at school. There are no records dating the event, so, at best, it can be fixed roughly sometime after the fair and before the approaching winter. Resigned to this course, neither Frank or Nellie would have chosen to put him, or, through the rigors of another winter, only to act in the spring. And by the next summer the cows were definitely gone. The only surviving evidence, from more than a year afterward, merely establishes that, by then, had been gone for a while. The confirmation is in a diary that Nellie kept later, during 1954. It was a spare effort — no elaboration, no ruminations. No day got more than a few brief words to record whatever was to be remembered. A long entry was ten or twelve. Some mark days when Jack came by. But there, one day in February, is the note: “Sold manure spreader.” It had, no doubt, sat empty behind the barn for months before they even tried to find someone who would want it. Surely, the decision to sell the herd was brought on by several factors — advancing age and the physical strain of the work, declining revenues, and new requirements of the creameries that bought the raw milk. My mother’s reservations about the old ways only mirrored public attitudes and trends in the dairy business. The companies that processed this commodity wanted more efficient collection and hygienic handling. To comply, farms needed mechanized milking equipment and refrigerated storage — and larger herds to justify those expenses. The day of farming at this scale, as an occupation, was coming to an end. And even if it were not, at there was a further element that outweighed anything else: the absence of someone to carry on, to take over from Frank. So, the departure of the last cows must have brought a tangled mix of feelings — relief and sadness, both. And finality. Perhaps in the years leading to this there were foreshadowing events — the last time of calving, maybe. Or, more likely, such moments were always offset by some innate human optimism that, if they held on long enough, someone might yet appear who wanted to take on this life. In any event, four years after the barn was rebuilt, the lofts no longer needed to be filled with hay for a herd of milk cows.